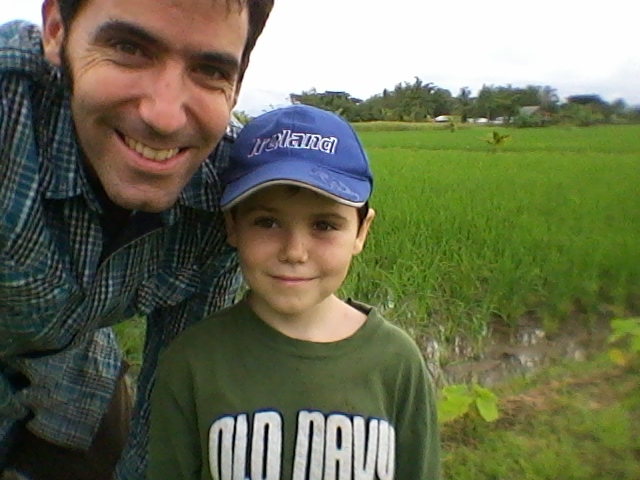 Yesterday, I had the opportunity to bring my son to the Charis Teaching Farm. 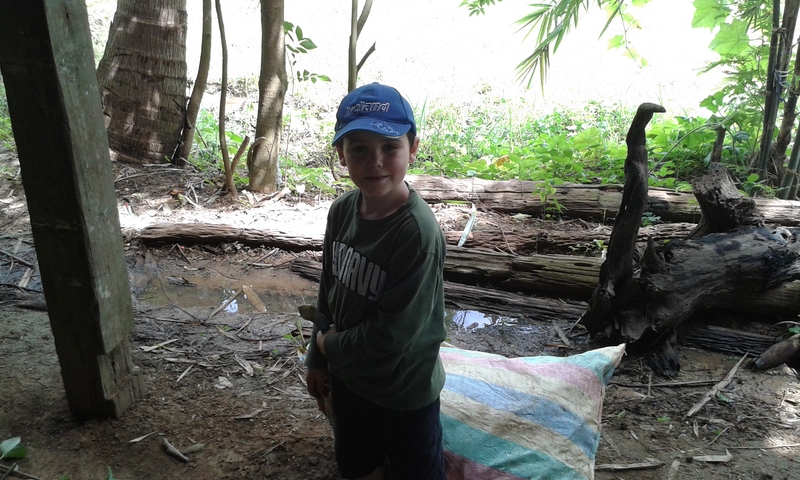 We had a great time together, exerted ourselves physically and learned about vermaculture. It gave me great pride to both share the farm with this guy and to watch him receive it with arms opened wide. We started by harvesting morning glory, called Pak Boong in Thai (Pak means vegetable in Thai, so most vegetables are called Pak _______; FYI). In the States, this is often referred to as water spinach and is considered a weed. We would consider it a weed except that it does what all plants do: convert solar energy into stored organic energy, and that is invaluable. We don’t bother getting rid of weeds unless they interfere with our work. We have a few plots filled with weeds because we know that once they die, we can compost them for nitrogenous fertilizers and organic inputs. On top of that, we can use the morning glory to feed our worms. My son carrying in his load of morning glory to be chopped. We traipsed out into the field and started yanking the crawling vines out and then carried them back to the shade of the house. Our farm manager, Sak Chai, harvested much more than us and had us hack it up into smaller pieces with a machete. My son looked at it and said hesitantly, “…can I try that?” Like any good father would when asked if his son can use a dangerous tool, I said, “Of course.” We had fun taking turns shredding it into bits and throwing the processed morning glory into two 55 gallon drums. Then he got to climb up and jump on the piles to pack them in as tightly as possible. When all was complete, we filled the barrels with water so that the weed could ferment and then be used as food for the worms. If you’ve read my Fermented Carrot recipe, then you’ll know that all the bacteria needed to ferment the weeds already live on the vegetable itself. This makes for a very simple, self-sustaining and replicable agricultural input. On other farms, the farmers would have just destroyed the weed, but viewing our farm through the eyes of permaculture theory, we look to see how our costs (weeds) can become profits (more worms and rich soil). Walking along the cannas, trying not to step on the crops or the thorns. 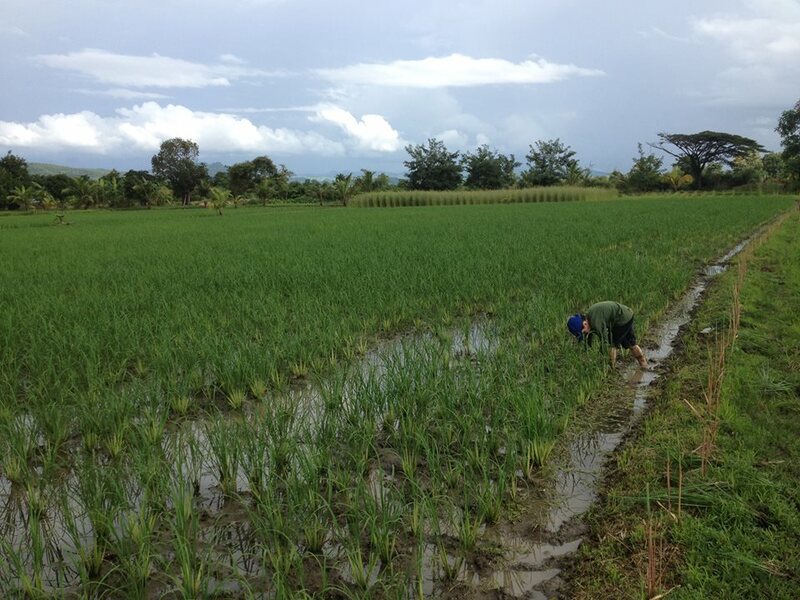 Next, we harvested rice straw that had been fermenting for the past eight months. We walked back and forth, carrying bins of decomposed organic matter from the field to the house. Once the five new bins were filled, we all sat down and began picking through our best-established worm bin. My son enjoyed seeing how fast they moved and noticed the different sizes. He and I were both amazed by how many there were. Once we were finished, I sprinkled our harvest into the five new buckets and the two of us headed out to the fields to pick weeds. And he weeds too! Wish we could hire him. I guess he’ll have to just do it for fun. My heart was soaring at this point. It’s rare when a father gets to share the world with his son. Sometimes I’ve felt like this whole trip to Thailand has been forced upon him rather than a gift freely received. But at that moment, I could see him taking it all in. He and I were a father and son, sharing in our love for each other and all of creation around us. He was excited to show me the snail eggs he’d seen earlier. 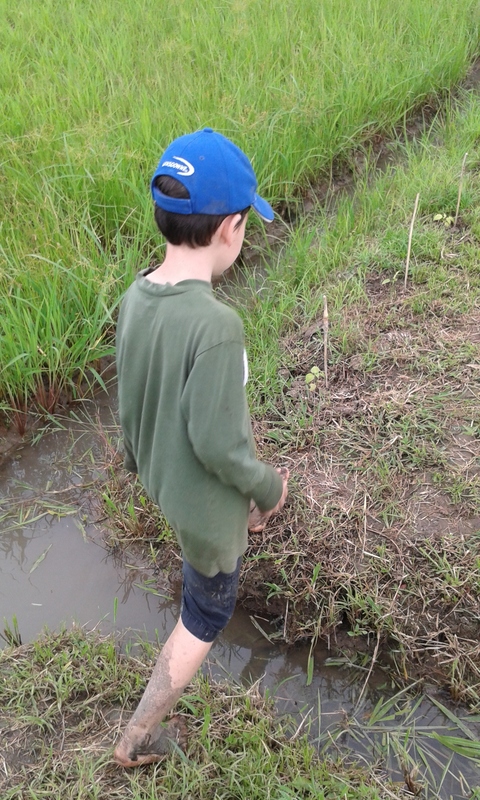 I got to show him some of the different crops we have planted along the cannas (the dividing burms between the fields). We talked about why our fields are looking better than our neighbors (something I’m very proud of and excited to share in another post soon).